DRIVERLESS VEHICLES – Is this the future for the Logistics Industry? The truck recently transported a full load of Budweiser beer in the western state of Colorado. The vehicle drove without the assistance of a driver for most of the 190-kilometer trip without problems. 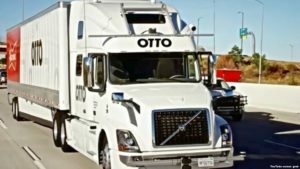 Otto, a company owned by the ride-sharing business Uber, operated the driverless truck. The truck carried about 50,000 cans of beer from the city of Fort Collins to Colorado Springs. During that time, the vehicle kept an average speed of about 89 kilometers per hour during the two-hour trip, Otto said. The delivery was the world’s first successful shipment by a self-driving truck, according to Otto and Budweiser’s owner, Anheuser-Busch. The company said a trained driver was inside the truck for the entire trip. But he only sat in front and drove the truck as it was entering and leaving the interstate highway. The rest of the time, he sat in a part of the truck used for relaxing and sleeping. Otto’s autonomous technology is designed for use only on highways. These wide roads do not have traffic stops or people crossing the road. The technology, including parts and software, can be added to existing trucks for about $30,000. The driver of Otto’s self-driving truck relaxes during a 190-kilometer trip through Colorado to transport a full load of Budweiser beer. Otto’s co-founder is Anthony Levandowski, a former self-driving car engineer for Google. He said he thinks the most important thing computers will do over the next ten years is drive cars and trucks for people. He added that his company is very concerned about safety. He said people should not be afraid to share the roads with Otto’s driverless trucks. Otto’s self-driving truck recently completed a 190-kilometer trip through Colorado to transport a full load of Budweiser beer. The trip marked the world’s first driverless delivery of goods for a company. Anheuser-Busch said the driverless delivery showed how the technology is becoming the next great innovation in transportation. The company plans to use self-driving trucks to help move more than 1.2 million beer loads each year. But the company says it will still need people in the driverless future. Humans will be used to do limited driving, oversee the loading process and manage trips.